Truly a man who’s done everything in Canadian motorcycling, John DeGruchy derived great pleasure as well as his livelihood from the sport but he gave back far more than he took away. 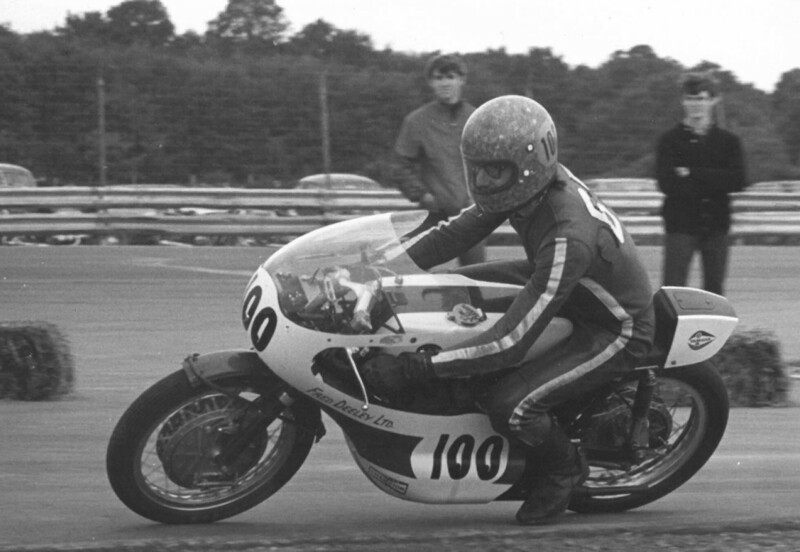 There are few honours that evaded him in his competitive years and even after retirement from racing he was applauded by customers for his service to the motorcycle business. John arrived in Toronto in 1954 from his birthplace in Jersey, Channel Islands, close to the coast of France. Emigrating with his wife Francine and infant daughter Annette, John’s priority was to make a new start in life. Recalling his first exposure to trials, scrambles and beach races on a BSA Gold Star at age 16, John had to wait three years to buy a second-hand Francis-Barnett trials bike and ride in the dirt again. A truck driver’s wage left a modest budget for motorcycling, so John’s involvement in road racing was limited. “The main thing that held me back was money,” he said. For a while he had the use of a Manx Norton belonging to Mike Duff’s father Alec, who would only entrust it to “someone who wouldn’t throw it down the road.” John also rode a sponsored Triumph in 1964 when his friend Bill Sharpless was injured at Daytona. “The one thing I could never get the hang of was dirt track,” John said. Determined to contribute to the organization of the sport he loved, John was a long-time member of the Nortown Motorcycle Club. He became deeply involved in Canadian Motorcycle Association affairs, starting in 1961 with the competition committee and progressing to Ontario region vice-president in 1962. He was elected president beginning in ’63 and continuing another five times until 1972. He was on the national executive for seven consecutive years between 1964 and 1970, serving as national president in 1967. The commitment of time and effort to hold a job, raise a family, start a business, go racing and serve so many organizational roles cannot be overestimated. He also found time to help draft a CMA road rider training course which was established in June, 1966. His term as national president in 1967 marked a high-water point for the CMA when Canada was awarded its first and only world championship road race grand prix. John presented the Centennial Trophy to the legendary Mike Hailwood for his win of that unique event at Mosport. John received government of Ontario achievement awards for his contribution to amateur sport three times between 1969 and 1972. Along with everything else, he also found time in 1966 to found a dealership called Sonic Motorcycles in Scarborough, Ont., in partnership with Bill Sharpless. The shop immediately became a hub for off-road riders and sold a range of brands that included Bultaco, on which John won so many of his awards. At various times Sonic also sold BMW, BSA, Ducati, Honda, Suzuki and Triumph. John finally retired from competition in 1975 and sold his share of the business to Sharpless. With another friend, Ken McAulay, he launched a new motorcycle wholesale business called Moto Mart to supply dealers with aftermarket parts and accessories. During the next 18 years John was on a bike regularly, calling on his dealer customers and earning the company a reputation for reliable, personal service. He remained president of Moto Mart until his retirement in 1993 when the company was sold to a larger competitor. After all these years, motorcycling remains an important part of John’s life. He is frequently seen at motorcycle gatherings and still enjoys touring on the road.